Let’s look ourselves in the mirror, fellow media members: We’ve all given the guy a free pass because of his amazing run to six straight conference finals and blithely ignored the fact that he’s screwed up a hundred ways from Tuesday since he decided to whack Flip Saunders after the 2008 conference finals. Check out the résumé and find me a correct decision. Just one. Fire Saunders? Wrong. Hire Michael Curry? Wrong. Trade Chauncey Billups? Wrong. Extend Richard Hamilton? Wrong. Sign Kwame Brown? Wrong. Go after Ben Gordon and Charlie Villanueva? Wrong again. In two years, the Pistons have gone from one of the best teams in basketball to among the worst. They stink, they’re capped out, and they don’t have much in the way of young talent; for all we know, in two years they’re going to be the Pittsburgh Pisces or the Seattle Grunge or something. If Isiah Thomas or Rob Babcock had done this, we’d have buried them alive by now, so it’s only fair for us to point out that regardless of his previous track record, Dumars is on a two-year losing streak of McHalian proportions. Anyone following the Pistons the last couple years would have a hard time disagreeing with any of Hollinger’s assertions in the piece. They’re plain to see. 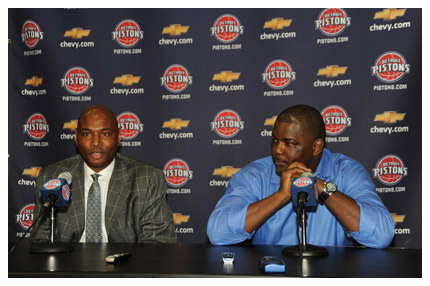 The last couple years have been a disaster for Dumars. One wrong move after another. And Hollinger doesn’t even mention Dumars’ terrible draft record: Darko Milicic, Rodney White, Mateen Cleaves, etc. Due to his previous successes, I believe Joe Dumars deserves a chance to right the ship. But given the downward trend of the team from bad to terrible and the looming possibility of new ownership, not to mention rumors he’s not getting along with the current owner, I wonder if Joe D. will even get that chance.